In an attempt to better organize the games and resources, I’ve decided to go to a blog format. Hopefully it will be easier to get around and find ideas to help you in your music teaching. Games are now categorized, and there is also a search function to quickly find specific files. You can also subscribe to the RSS feeds so you you will be notified when there is a new post. For a short video on what RSS is and how to use it, click here. Each year, children in the Church of Jesus Christ of Latter Day Saints (LDS) learn songs for a presentation given to the congregation in the Fall. I have taken the songs for next year and arranged them for Primer/Level 1 students. 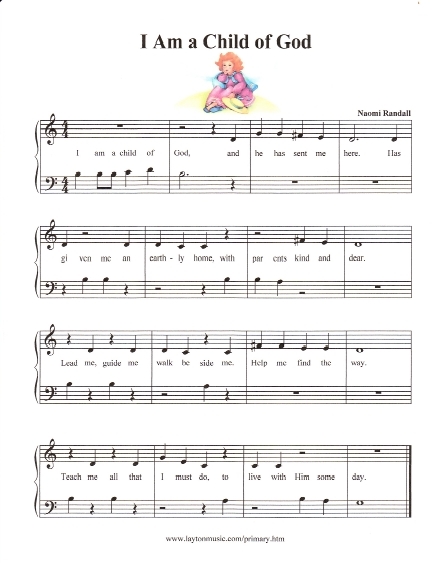 You can find them at my Primary Page, as well as a few other Primary songs arranged for beginning students. CLICK HERE for an updated post about the simplified primary songs. Nothing fancy with these! 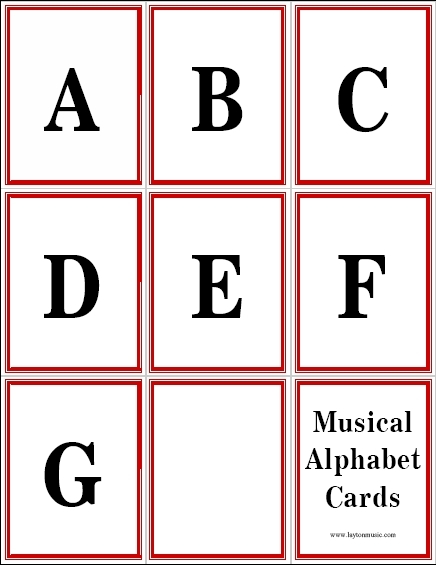 Just cards with the musical alphabet on them. I also included cards with the sharps and flats as well. Great for learning the musical alphabet forwards, backwards, and skipping up and down. Also use them for scales, chords, and anything else you can come up with! and learn quickly through enjoying the game. would you make that fun? along to the rest of the teachers in the world! marker can write on and is large enough to walk on. to see your feet standing together on the line. names of the musical scale on each note. Laminate so they last longer. of you jump on the right note. Say the corresponding word (ex. name is incorrectly given, you must start over from the beginning. will be given if wanted. FACE rhymes with SPACE! Do the same thing as you would for the lines. Make it challenging by mixing up lines and spaces. they can choose notes from all over. Thanks Natalie for these great ideas! This GREAT game idea was posted by Cecilly on the Yahoo Piano Teacher’s List. I have made up some ornaments with landmarks, and several variations that you can use. Christmas Stockings with Letter Names – Just for something different! Just a quick mention of another of my off the bench activities, this one to reinforce my Celebrate Piano student’s landmarks (Bass C, Bass F, Mid. C, Treble G, and Treble C). It’s a “Swat the Landmark” game. To play: lay out all the cards face up randomly on the floor. Seat player on the floor in front of cards with flyswatter in hand. You control the timer. Set timer for 60 seconds (I use a 1 min. egg timer). At “go” you call out a landmark by name after which the student slaps at the corresponding flash card. If correct, a point is earned, if wrong a point is deducted. Immediately after a slap, call out “correct” or “error” then the name of another landmark. Names may be repeated. See how many points can be earned in 1 min. time. Slapping too hastily (and often incorrectly) will hurt the player’s total. Record their base score and then on subsequent playings, try to beat that score. shaped Christmas tree cut out of green poster board. I’ve mounted it on my wall with poster putty, and then am going to mount the landmark cards randomly on the tree (like ornaments) also with poster putty. The student can then stand up to play the game. Fun fun. 1. Play an interval at the piano and having the student “swat” the correct interval. 2. Show a flashcard of a note, chord, key signature, or whatever. Great for players of different levels. With it’s several variations, this is a great game for Christmas group lessons where students are of different levels. 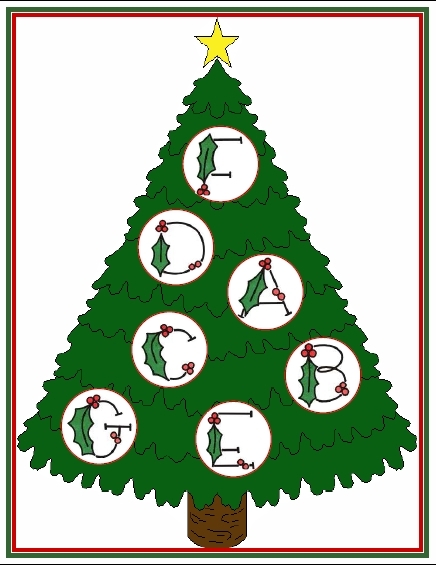 A Christmas tree is adorned with musical alphabet ornaments. 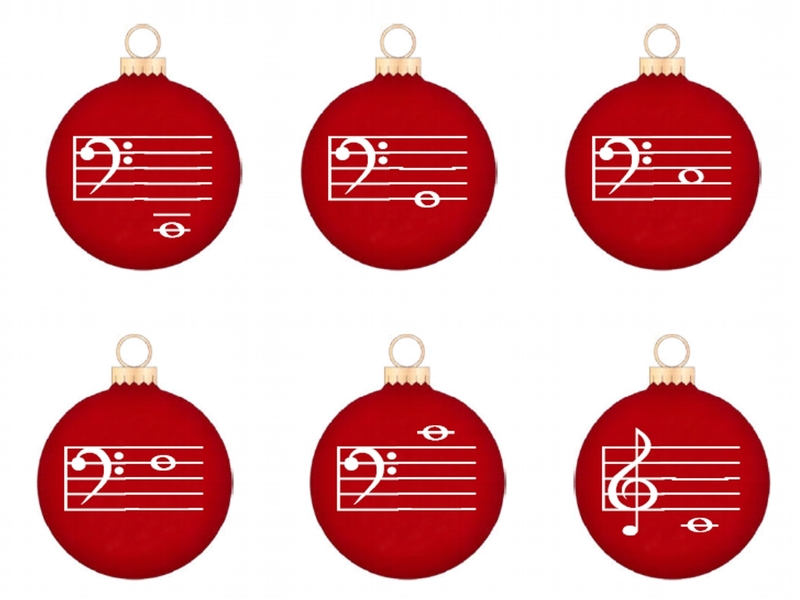 “Decorate” the tree by matching either the note on the keyboard, bass clef note, treble clef note, or key signature to the tree. Can be played individually as well as in a group. 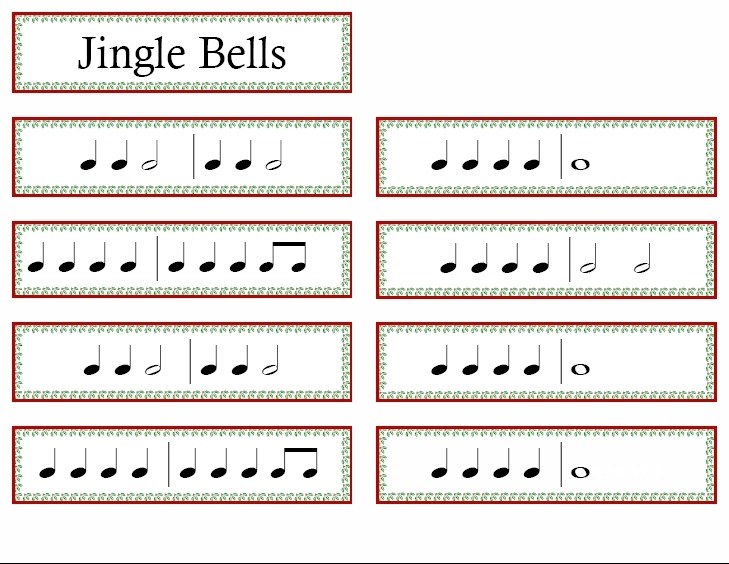 Mix up the rhythms from eight Christmas carols, and have students place them in the correct order. There is an assortment of rhythms from easy to more complex for many levels of students. I also did up rhythms for two Hanukkah songs – My Dreidl, and Chunukah. For some odd reason, I made up these rhythms to read from the top of the first column down, then the second column down. Not that it matters, since they get all mixed up after they are cut!